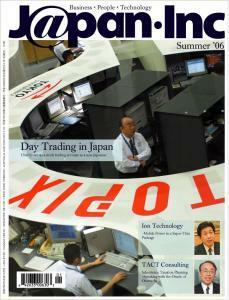 On the cover: Day Trading in Japan: How to set up a stock trading account as a non-Japanese. Wizaz's new software removes the threat of unwanted communications. Sigmund is, in fact, a piece of software, the latest brainchild of serial Tokyo-based entrepreneur Tim Romero. A venture company nearly halves the production cost of power cells. A Tokyo-based venture company called Ion Technology has created a true paper-thin battery (not a capacitor) by developing an active solid electrolyte from naturally occurring minerals that when processed can be printed, or pasted, as a powder solution on to paper and plastic base materials for use as a battery. The Japanese stock market has risen over 50% in the last five years, and last year was the best-performing major stock market in the world. As a result, trillions of dollars of foreign money has been pouring into the Tokyo Stock Exchange alone over the last 12 months. Forbes.com reckons the increase was 38% last year to US$54.8 billion, about 160% more foreign investment than in 2003. A talk with Takashi Hongo, president of TACT Consulting. Perhaps the most reputed and capable expert of all is 59-year-old Takashi Hongo, whose company, TACT Consulting, assists businesspeople throughout Japan. I was introduced to Hongo-san by an acquaintance who recently sold his property management business, and wanted to retire knowing that his family was taken care of. J@pan Inc -- Putting the "!" Behind the "*"
One of the most difficult and expensive office equipment procurement decisions a manager can make is that of buying a PBX. When all most of us want is simply a phone that is easy and convenient to use, why is it that these complex and hard-to-remember systems cost more than the entire inventory of office PCs? Read more about J@pan Inc -- Putting the "!" Behind the "*"
Japanese companies venture into the transgenic mouse trade. The breeding and distribution of transgenic mice, mice with deliberately and artificially altered genetic backgrounds, is a business with a steep learning curve, high entry costs, and high risk. A business opportunity? Absolutely not, say most. Reflections on the writer on the tenth anniversary of his death. This year marks the tenth anniversary of the passing of Ryotaro Shiba (1923-1996), novelist, essayist, travel writer. Yet 250 paperback editions of his 350 books still line store shelves. In January NHK began a yearlong broadcast of an adaptation of Shiba's novel Komyo ga Tsuji. And recently the Asahi Shimbun held a symposium on Shiba. Tips for choosing physicians and hospitals. J@pan Inc -- Japan: Land of the Rising Target? Japan must now aim to reduce emissions by as much as 15 percent. Japan, steeped in a tradition of honor and commitment, must face an embarrassing truth: it has not made a dent in its Kyoto Protocol target emissions, its 6% target reduction soaring to an 8.3% increase by 2003, which essentially put the target in the vicinity of 15%. Read more about J@pan Inc -- Japan: Land of the Rising Target?